Just starting a thread for updates on my Perone Hive. Feel free to chip in with thoughts and comments. June 3rd weather has been fairly sunny but quite windy. Bees are busy doing orientation flights but pollen and nectar also going in. 23rd June Sunny spells and windy bees quite busy bring in steady steam of nectar and pollen. 1st July had a look inside the brood chamber through the observation hatch at the back. The bees have built some lovely combs on the west hand side of the hive the combs are running with the top bars north to south. And the entrance faces south. Activity has slowed now from initial start however expecting a pick up as brood hatches and begins to fly in next few weeks. 5th July Nice warm sunny day bees quite busy pollen and nectar going in bees have started working the white clover. Managed to take a picture inside the brood chamber. Think there are about 8 or 9 combs some of which are a very good size. I'm very pleased. Some estimations and math leads me to believe there is about 3000 square centimetres of comb. Roughly 26,000 cells! So if all goes well they should build up well. That is impressive. I am looking forward to more pictures as you put them up. Keep them coming. Hi all just posting an entrance video update. Taken today, 6 weeks since the swarm was housed. The bees have been busy taking in pollen in the 1st UK summer for a few years! The first brood to hatch should be starting to fly in theory. So it will be interesting over the next few weeks to see if the expected rapid increase in activity happens. Hi Andy, I'm also a Linux user. Sometimes I was getting the same problem i.e. black screen plus sound. However the download link also included should prompt a .mp4 file to download. I use VLC player as it has most of the codecs built in. Let me know if you have any luck with the videos. I had to wait 300secs (terrible! I know in the instant world we live in) to download it and then it played with mplayer (I am hanging on to Ubuntu 10.04 lts until the last possible moment...til it dies and goes to disto next world). I would have liked to stream it but couldn't but that way worked fine and enjoyed your clip. I was thinking back to my first computer today, an Amstrad green screen....we have come a long way in a short time. Have you peeped to see how they are progressing? Andy, if you use google chrome or chromium as web browsers it plays fine. I get the same problem if I stick to firefox. Not tried Opera yet. I use different browsers for different things so I have them all installed as some things work better on each. Having the most up to date Ubuntu version seems not to make any difference. Had a quick peek inside the Perone today. Trying not to do it too often. The combs are of a similar size to what the were on the 5th of July however now you can see brood on 5th comb from the left. The activity of the foragers has really picked up. I think they are working the sweet chestnuts, a few lime trees, clover and borage. First video: Inside the hive through the viewing hatch. If you look closely you can see some pollen being hauled about and also it look like the bees have propolised between the boards on the far side. The direct downloads aren't working at the moment but will have a look later. Hope you enjoy the updates. How are other peoples Perones going so far this year? I have just had a KTBH that was a prime swarm we caught and housed on the 17th of June build up and swarm again. Must be good times for the bees. Your Perone colony is looking great. Same here re prime swarm collected 7th June and off she went again today after building and filling 18 bars of my Kenyan. There was a time when you could house a prime swarm and just leave them to it for the rest of the year in the safe knowledge that they were settled til next season! Obviously not anymore! Very good update... and I could stream it with firefox and ubuntu 10.4! As usual, no idea why, I have not changed any settings and now 10.04 is not supported very few updates come through. I was hoping a few other people who had managed to start Perones this year would be starting update threads themselves, while we sit and twiddle our thumbs, but as yet no one has posted. Glad to see success to date out there!!! Still no luck over here in France re swarms - am even tempted to hang five frames from a nuc to get the Perone off but realise this is not the perfect solution. In the meantime will carry one twiddling my thumbs. It is a very frustrating this year. I've got six Perones populated between May and June this year, and they all seem to be going gangbusters. I mostly stick to another forum for bee-related goings on, though. they were all prime swarms as far as I can tell, except for the last, which was a young colony that I cut out of a barn wall. been leaving them alone for the most part, so I don't really know what's happening inside. the folks hosting one of them can't resist opening it up for a peek every now and then, though. that one built from the floor up, and had filled about a quarter of the brood chamber as of three weeks ago when they last had a look. Mr Cadman resist the urge! It is too late now anyway over here, frustrating and disappointing as that is but there is always next year, and I do not have to make another to cart to the convention, hooray! Prime swarm or chuck some casts together...next year will be great! Reverend Tel thanks for the update on your six especially with the similarity of climate of the Pacific north west and the UK. It is a very lovely part of the world (my brother is a Seattle resident and texted me a little while ago to say he had found himself in a flying/moving swarm of bees in his neighbourhood) We could do with you keeping us posted on this forum. Have you been following the Perone developments on this forum or elsewhere? If your other contacts could check in as well we could get some good initial idea of the viability of the concept in temperate areas. Are you using the mk1 or mk2? Will you post an intro on the forum so we know about your bee keeping interests and pop USA onto your location as Washington is a town in the east of England or a village just north of Brighton in England and probably a few dozen more places too! We could do with you keeping us posted on this forum. Have you been following the Perone developments on this forum or elsewhere? I've checked here periodically for the past year or so, but I've also quickly run into the dearth of English language information. I moderate the honey bee forum at permies.com, so that's where I post. If your other contacts could check in as well we could get some good initial idea of the viability of the concept in temperate areas. I don't have a whole lot of contacts, to be honest. apart from the folks hosting my own hives, I don't know of anybody else locally using Perone's design. Are you using the mk1 or mk2? mk2. I've mostly used Warré hives in the past, and I really like the top cloth and quilt from that style, so I added those to my Perone hives. I wish I had added windows (nice work, Fuzzy Bear), but the lumber I'm using wouldn't really be conducive to it. I do have one stack of Langstroth boxes that a swarm moved into last summer. I've been managing that roughly like the mk1 design. Will you post an intro on the forum so we know about your bee keeping interests and pop USA onto your location as Washington is a town in the east of England or a village just north of Brighton in England and probably a few dozen more places too! profile updated. I might do an intro at some point, but I'm really resisting getting too involved with another forum. short version: I build and sell Warré hives, but I'm trying to transition toward selling honey instead. I'm clumsy, and every hive I build is a risk to my fingers. then there's the cedar dust. that's done in many a logger and woodworker in these parts. sorry, Fuzzy Bear, for hijacking the thread. if there's a moderator paying attention, maybe this could be split into another thread. No worries Reverend Tel feel free to get stuck into the thread. I was watching the hive today around 1600 this afternoon. There were lots of drones piling into the hive. I assume they were from another hive but not 100% sure. Perhaps they are thinking of a supersedure any thoughts? I will try to get a video if I can and upload it. Firefox seems to work now with videobam which is good. No worries Reverend Tel feel free to get stuck into the thread. in that case, here's a photo I took late this afternoon. it was fairly warm here today. Great picture! Nice to see a good bit of bearding on a hive that big showing a high worker population. here's a look at the colony that built from the bottom up. I think this was taken a little over a month ago. obviously not the best picture, but you get the idea. that branch was what I found the swarm on. I cut it off the tree and set it in a pail, then pulled it out and set it in the hive with the bees still on. Picked up a swarm today which had been smoked out of a chimney. Decided to swarm to the nearest tree and settle about 20 feet up!! Owner was going to cut back tree anyway since it was touching roof. With a good rope and saws, managed to cut smallish diameter trunk and 'drop' to ground. Even when laid horizontally, bees managed to maintain beard on branch, which was cut off and bees shaken into empty nuc box. Hoping I have unharmed fertilised queen - they will be introduced to the Perone tomorrow. Smoked out swarm put into Perone this morning. All bees very calm and formed an orderly queue to 'move in'. Hive seemed to be very well accepted. Will watch with interest and post any relevant updates. Fuzzy Bear, do you have any photographs showing the design of your window that you would be willing to share? Good luck Mr Cadman sounds like it went pretty smoothly looking forward to some news. 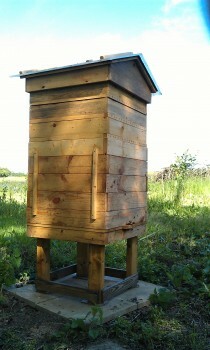 Hi Reverend Tel, I'm very impressed with your pictures hive looks very well made. Amazing the bees are building upwards! The window is very basic! Cut a rectangle out of one of the planks slightly narrower than the width of the plank. Then screw it to another piece of wood bigger than the hole you've created (making the window shutter). Then Screw the window shutter through the larger piece of wood back onto the hive to keep the hive closed up. Videobam seem to have fixed the firefox bug but unfixed the download direct option. Win some you lose some! just noticed some drones coming and going at the hive in my driveway over the last couple of days. hadn't seen any drones since installing the swarm, though there were a few with the swarm. Visited the Perone a day after installing and all seemed OK with good density of flights. Went down today to find all absconded! Did leave some old comb, sugar syrup and candy to make them feel at home but to no avail, even with queen excluder over entrances. Some comb had been built though from the middle bars of the lower 'bee area'. Sorry to hear that Mr Cadman that's really annoying. I've had three swarms abscond from KTBHs this year and 4 successful housings plus the Perone. Today I was down at the hive it has been pretty hot and humid today. The bees have stepped up activity and the foragers are going well. I was watching the hive and noticed a couple of wasps trying to get in one succeeded the other failed. There was a worn out worker bee on the slabs the hive is on. Anyway the wasp that didn't get in the hive set upon the poor worker on the floor. He quickly chopped him in half and carried the head and wings off. then came back for the sting. Has anyone else seen this activity? I thought it might be a hornet but it was too small the same size as the worker bee. Maybe the wasps just hang about scrounging what the bees throw out i.e grubs etc. If it happens again I'll try to get a video. Yes better luck next year Mr cadman. I have just lugged mine out of the field it was in so it will be next year now...it is going to make one more appearance next weekend! I am seeing much wasp behaviour like you describe but think they are currently cleaning up. We are going to have big wasp trouble round here this year. One of the things I am particularly conscious of is during this overcast weather the bees are not hugely active outside the hive despite the warmth...22C... they are up to stuff inside the hive, this and that. But, the wasps are active outside, what is keeping the bees in is not keeping the wasps in so they are mooching closer and closer to the doors. Something to keep an eye on in the coming weeks, preparing to shut the doors down a little...I have seen what they can do to a strong hive. it was another warm afternoon with more bearding. it's a considerably bushier beard today than my previous photograph. as it is not considerably warmer (a bit cooler, in fact), I can only assume that the population has grown somewhat. Great picture, that's a lot of bees! My Perone bees haven't done any bearding yet but it probably isn't as hot here. Activity is pretty steady. Bee's working some tall weeds with small pink flowers and Borage amongst other things. Fair amount of pollen coming in. Andy how is your MK1 doing at the moment? Off to have a look now, the farmer is combining the field next door. Just been watching the hive. Lots of Drones piling in during the afternoon session! Saw one drone who was worn out evicted from the entrance. Less than 5 seconds later a wasp had him! Poor old boy. The wasps aren't daring to go into the hive yet. I will have to keep a close eye on the situation. 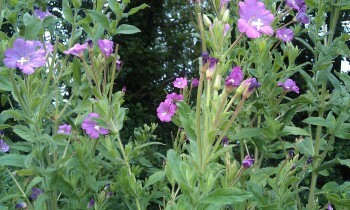 Got a photo of a honeybee on some willow herb. They seem to love it at the moment. And a video of the entrance activity this afternoon.